Ring Wars Carolina presents "HOMECOMING 2013" featuring WWE Legend, "The Native American" Tatanka vs. Ring Of Honor's "King of Old School" Steve Corino. This is going to be a showdown everyone will be talking about for years. The only Native American wrestling superstar returns home to answer the call out from ROH Scum rep! Hangtyme cost Anthony a win in the championship match at the last show and he wants pay back! Security had to step in a pull these 2 apart, but not this time! This 2 will go toe-to-toe in a No Disqualification match! May the best man win! Devyn has been on a US tour, collecting wins and gaining momentum since the last time we saw her. Mia however has been waiting for her rematch for the AIWF Womens Championship. This is sure to be a barn burner. 2 lovely Ladies, fighting for a championship! Spells winning ticket anywhere in the building. The newly crowned champ Nemesis made a good friend in Andrews at the last show, NOT! Mr. Everything wants it all at Homecoming 2013, and that includes some RWC gold around his waist. Nemesis is no stranger to titles in RWC. Can't wait to see these 2 high flyers push it to No Limitz! The champs have been on the road, but they too will return for the Awesome Homecoming 2013 event and will try to beat the returning team from Korea, The Krayoz. The fan favorites, Krayoz look to add the word World to the RWC Tag Team Championships! Sure to be the best Tag Team match this year! There are only 40 advanced tickets left for "Homecoming 2013" & they are at Lumberton Indoor Flea Market right now. Once these run out it's the regular price! Don't forget the Awesome Meet & Greet for Exclusive VIP's going on at the Golden Corral in Lumberton, NC before the show. Here is your chance to meet "The Native American" Tatanka before the show and enjoy a great buffet right after the wonderful parade and get a free ticket to the show! Click here to reserve your ticket today! And as always, RWC didn't forget about other Wrestler wanting to step up or aspiring wrestler. 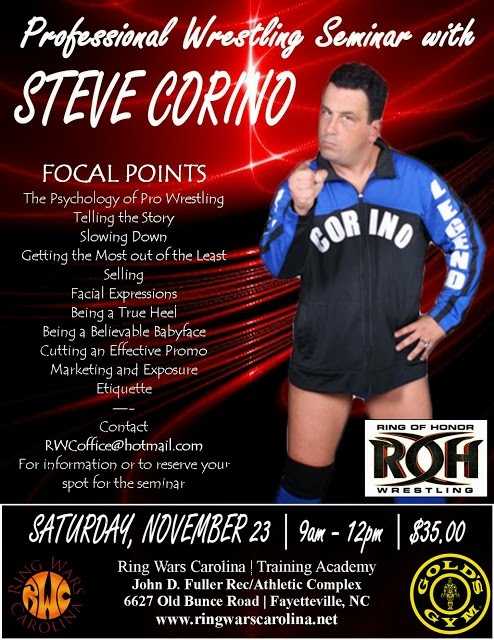 The Steve Corino experience is coming also. The 1st wrestling seminar where you actually learn something without getting sweaty. This classroom based seminar will teach you how a indy wrestler becomes a professional wrestler. RWC has something forever one November 23, 2013 in Lumberton NC. See you at the show, " HOMECOMING 2013!